Today’s Therapy: An evening well spent with Megan Bonnell, Emilie Mover, and Samantha of Peas&Carrots. There has been a lot of chatter about Emilie Mover and Megan Bonnell around here. I heard Megan’s first album when it came out a few months back, and started listening to Emilie just a few weeks ago. Both of these ladies have enough merit to earn their own posts, but the icing on the cake was our contest for tickets to this show. 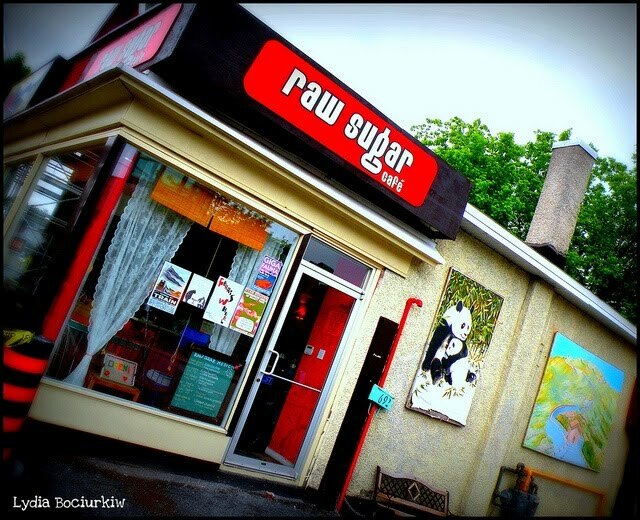 The scene was set at Raw Sugar, a small cafe in Ottawa known for it’s delicious desserts and special evenings with DJs and board games. I didn’t think this was the type of place that could cater to much live music, but for the evening they had planned I could not have asked for a better venue. With around 20 people in the place and some laid back music ahead, we were all ready for a very intimate performance. First up was Samantha, one half of the Ottawa duo known as Peas&Carrots. Samantha went up on stage with three things: a guitar, her voice, and a rather nasty cold. Facing some serious musical adversity in the form of a lost voice and sore throat, Samantha managed to pull off a very charming performance. She had a handful of songs for us, with some soothing guitar lines and beautiful singing despite her difficulties. In the tiny atmosphere of Raw Sugar her apologies and speeches between songs made her connect with the audience. She was just like any of us, but with a much better voice, and her music was very well received. Next up: Emilie Mover. Once again, the music consisted of some nice, easy guitar-and-voice pop. These songs of love, lost love, and loneliness seemed to fit a perfect mood for anyone gearing up for a romantic Valentine’s day or if you’re spending this February 14th reminiscing like this guy right here. At this point I was fully eased into the homey surroundings at Raw Sugar. I was perfectly relaxed and enjoying some easy listening from women who were in no rush and had voices that could bring calm to even the most aggravated spirit. For me, this summed up Emilie’s performance. The slight rasp and very slow tempo were like a thick blanket and your hot beverage of choice in the middle of winter. There was nothing too fancy in Emilie’s music, but she delivers exactly what she sets out to do, and she does so beautifully. Megan Bonnell closed of the evening with her voice and piano combo. I found that Megan’s album has a little more punch than Emilie’s Mighty Time, but in this solo setting she also decided to lay right back and preserve the mood set by the previous musicians. That being said, I thought that Megan Bonnell did put a little more fluctuation and drama into her set. Her style of singing actually seems to conform to the usual style of singer-songwriter of piano rather than guitar. I find pianists tend to bend their dynamics and timing a little more than guitarists, and I thought this showed in her singing just as much as her piano work. Before the show, I had hoped that Emilie and Megan would team up for a song or two. It turns out they had been practising a cover tune while hurtling down the 401. The result was an unpolished and under-rehearsed version of…I can’t remember the title now…but it was easily the highlight of my night. With Emilie taking the guitar and lead vocals and Megan accompanying with the low harmony, the two combined for a lovely and down-to-earth performance. It was clear that they hadn’t necessarily decided that they would play this song, and it was a really nice treat for the small crowd that had been so kind to them all night. Top marks to everyone who played at Raw Sugar last night, it felt amazing to get a mid-week night of relaxation courtesy of Emilie Mover, Megan Bonnell, and Peas&Carrots.